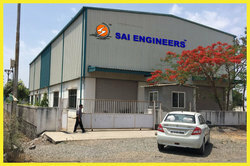 With the target of serving the clients in best possible ways and offering the qualitative range of House Hold Steel Products in industry, "Sai Engineers" set up its business as a Proprietorship Firm in the year 2005. Our organization is engaged in manufacturing and trading a vast variety of House Hold Steel Products others that are used in various industrial applications. We have sourced high grade raw materials and stainless steel in fabrication of these products from registered vendors. Our quality tested range of products is demanded across the globe for their sturdy nature, abrasion resistance, longevity, optimum strength and rugged designs. We have a state-of-the-art infrastructure and latest machinery to manufacture an innovative range of durable products. Creatively designed by a team of skilled and experienced designers, these products are extensively demanded in the market. This proper order of ours, includes varied areas of planning, execution and finalizing the designs according to the customized specifications provided to us by our clients. Our expertise lies in delivering consistent and high quality products which helped us to emerge as leading manufacturers in this domain. Apart from this, we have strong work force, their commitment towards organizational goals helps us in executing all business activities smoothly and achieve the complete client satisfaction. Our sound and well equipped infrastructure facilitates us in executing all the operations and processes within the short duration of time. We have segmented our infrastructure in several units that enables us in carrying entire processes in smooth and efficient manner. Moreover, under the able-support and astute guidance of our mentor and owner "Mr. Lalit Gawde", we have achieved the top position in industry. Dedicated and excellent workforce is the main strength of our company that enables us to gain a remarkable position in industry. We have hired these technocrats on the basis of their experience, knowledge and skills. Moreover, our team members work with the mutual understanding with each other and enthusiasm that help us in completing the consignments within the prescribed time frame. We offer our client options of customization which has made our products popular. We collect the technical details and desired designs, so that we can manufacture our S.S. Railing according to the specifications laid by our customers. We are concerned about the requirements of our customers and take extra care to hand over the products in the exact specifications and dimensions, demanded by our customers. We also ensure that our products are defect free and have no complaints of malfunctioning. We are focused on fulfilling the diverse requirements of the clients and meeting their complete satisfaction through offering them the qualitative range of products at reasonable rates in market. Our fair deals and ethical business policies have made us the preferred choice of our valuable clients. Besides this, we ensure that the range of products offered by us is flawless and reliable in nature therefore our experts sternly check each product at the time of their production process.